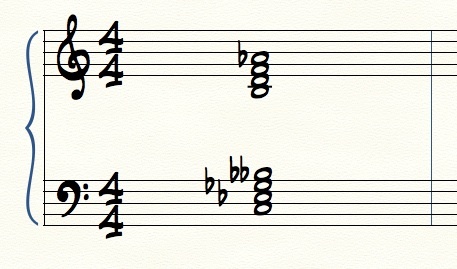 These two scales, the half-whole diminished scale and the altered scale, are actually very similar, differing only by one or two notes (there is an extra note in diminished scale). These are two of the most used scales in modern jazz. Understanding these scales can unlock lots of great ideas in your playing! To be clear, scales are good for note choices to help make melodies, but we aren’t just playing scales when we improvise! We don’t improvise scales; we improvise melodies! These scales are just tools for you explore some hip note choices in your melodies, especially over dominant chords. It is also worth mentioning that, while we are primarily discussing dominant chords in this article, there is also a diminished scale that can work over a diminished chord. Diminished scales can be used over diminished chords if you start with a whole step (the whole-half diminished scale) instead of with a half-step. To emphasize the continuity of the chord tones over the course of two octaves (see diagram below). If you played each chord tone sequentially by half-steps and whole steps instead of stacking thirds, then you have a diminished scale! The whole-half diminished scale is useful to make melodies over a diminished chord, not a dominant chord. That is as far as I’m going to discuss diminished chords or the whole-half diminished scale in this article because the focus of this article is on dominant chords and scales rather than diminished. 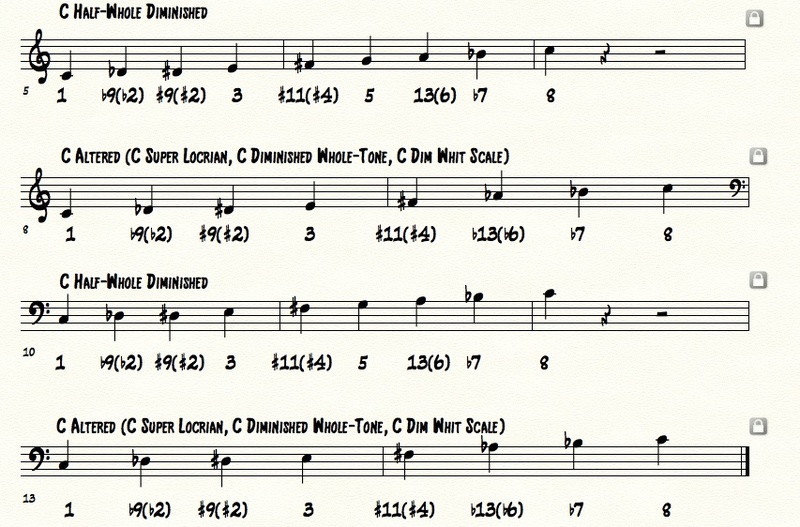 We have written in-depth about diminished harmony a number of times if you are interested. Back to dominant chords and scales! Because scales and chords are just two sides of the same coin, we are going to start with extended chords. These extended CHORDS actually have EVERY note from the half-whole diminished and altered SCALES, but written as a CHORD. These chords have a dominant C7 chord at the bottom and several extensions (9ths, 11ths, and 13ths) above the C7. The first column has chords from half-whole diminished harmony. 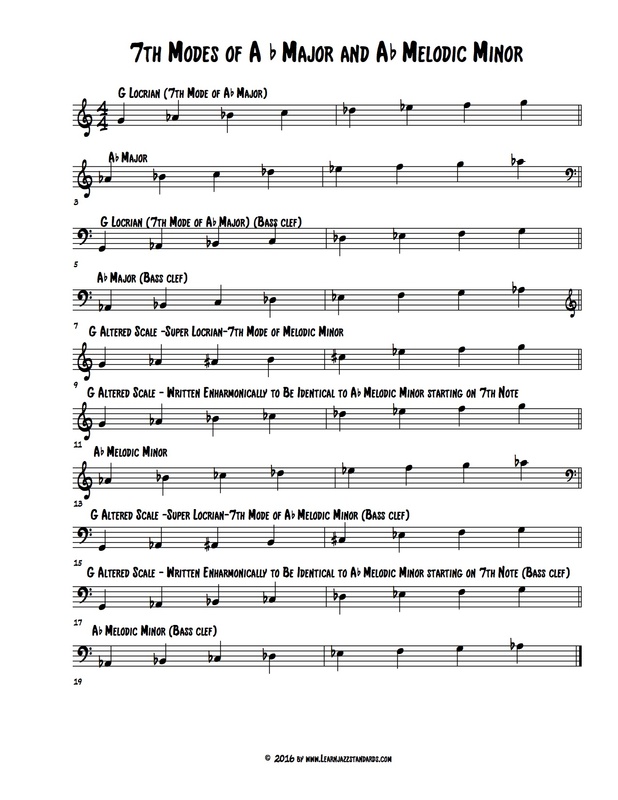 The second column has chords from altered dominant/melodic minor harmony. We have written out these chords in treble clef AND in bass clef, to accommodate our friends who play bass and trombone. Notice that there are several names for each chord. Remember, chords and scales are two sides of the same coin! C13(b9) is the preferred nomenclature for a chord which uses harmony from the half-whole diminished scale. C7alt or C7(#9,b13) is the preferred nomenclature for an altered chord which uses melodic minor harmony. The other, more complicated nomenclature is perhaps more descriptive, but nobody wants to read them! Use C13(b9), C7alt, and C7(#9,b13) if you are notating chords. So why did I even bother writing C13(b9,#9,#11) if no one wants to read that? That tells you EXACTLY what notes are in the chord AND in the scale! C13(b9) is the shorthand version. No one should use Ebmin7(b5)/C7 for nomenclature except in a teaching application. I wanted to show that it’s the enharmonic equivalent (using different accidentals for the same notes) of an Ebmin7(b5) (Eb Gb A Db) (technically Bbb instead of A) above a straight C7 (CEGBb). I would NOT write that in a chart! That first notated chord in the image above contains every note from the half-whole diminished scale! 1, 3, 5, b7, b9, #9, #11, and natural 13. The second notated chord in the image above contains every note from the altered scale! *Notice that the natural 5th is a “secret” note in the altered scale. It actually isn’t part of the scale as it’s usually played, but it is technically part of the chord and is also an acceptable note choice when improvising over an altered chord! Remember that scales and chords are two sides of the same coin. These chords with extended harmonies (9ths, 11ths, and 13ths, along with the altered note choices b9,#9,#11, and b13) contain every note from their respective scales. 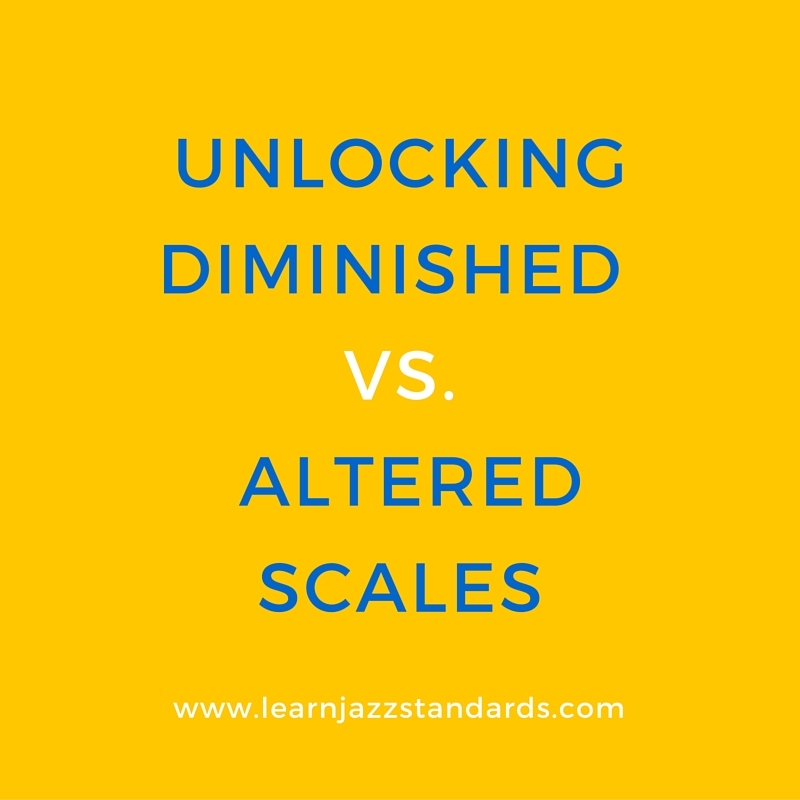 Here’s a PDF of the altered and diminished chords and scales from this lesson: Altered vs. Diminished Scales. We’ve also written some licks from the altered scale and the half-whole diminished scale to help you learn how to make melodies from these exotic scales! With practice and dedication, and by listening for these sounds in recordings, you can incorporate these scales in your improvisations over dominant chords. If it’s slow going, take heart; I learned about these scales several years before they started to work their way into my playing! Thank you Camden, your lessons are truly useful. If I could start over it would be here.